SPPH MHA candidate Olga Sawatzky won a 2016 Robert Wood Johnson Award, at a special ceremony hosted by the Canadian College of Health Leaders (CCHL) and the Canadian Healthcare Association (CHA). 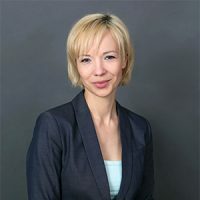 Olga Sawatzky immigrated to Canada from Latvia in 1998, and spent seven years with Canadian Forces Medical Reserves while completing her education. She obtained a Bachelor degree in Administrative Studies at York University and a Bachelor of Nursing at the University of Toronto. In 2007 she moved, with her family, to Kelowna where she currently works as a Patient Care Coordinator in Kelowna General Hospital’s Operating Room. For the past eight years Olga has concentrated her efforts on the operational improvement and team dynamics in Perioperative Nursing practice. She is excited to bring the knowledge gained through the MHA program back to her practice settings, and she is looking forward to helping build a healthy workplace environment at Kelowna General Hospital. Olga was presented with the award during a ceremony held during the annual National Health Leadership Conference in Ottawa on June 6, 2016.